Monday, March 13, 2017: Underway from San Diego’s Admiral Baker Park shortly before noon under sunny skies and a temperature of 82 degrees…thirty minutes later we rolled into Del Mar Beach Campground under heavy coastal fog and a cool damp 61 degrees!?!? That’s the nature of winter weather along the coast of California…but within another hour it was bright sunny and back into the 80’s! And the oceanside sunset in Oceanside was an inspiring sight to enjoy our evening cocktails by. 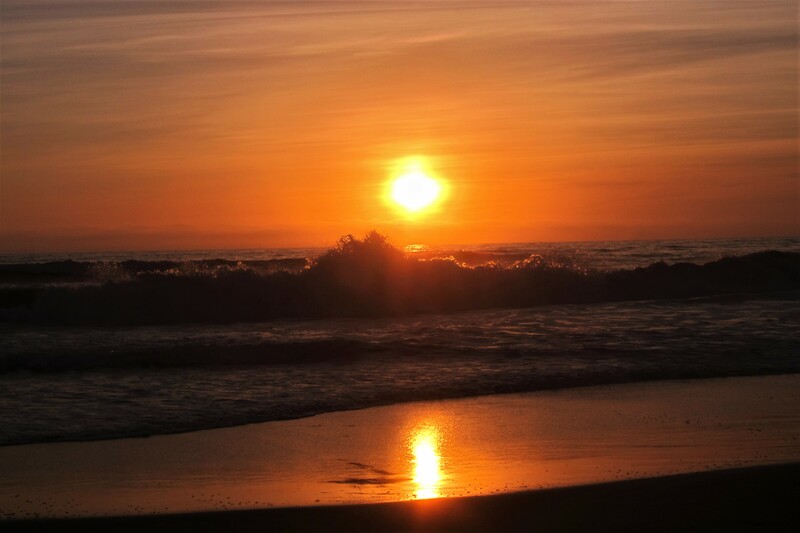 Goodnight from the California Coast. Monday, March 14 through Friday, March 17, 2017-Del Mar Beach, Oceanside, California: Woke to a foggy, but warm coastal morning. 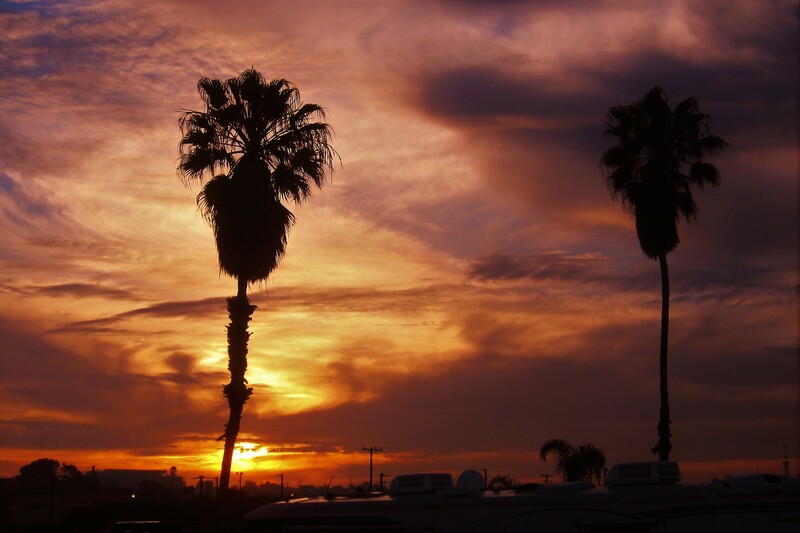 Del Mar Beach is a Military Recreation Facility on Camp Pendleton Marine Corps Base and features, in addition to the RV Park, a number of cottages, a nicely stocked mini-mart, plenty of beach chairs sitting under thatched cabanas, and a primo outdoor Mexican café, known as The Cantina. 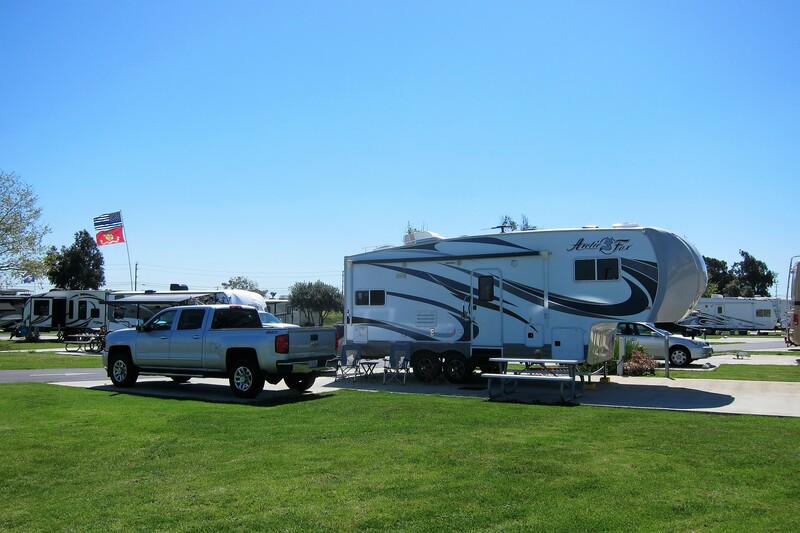 The campground is arrayed in rows…the further from the front, the lower the price. But even at that, the front row is usually booked solid anywhere near the weekend, so we occasionally must settle for row number two…which usually develops into a pseudo front row spot when the “Weekend Warrior” folks pull out. 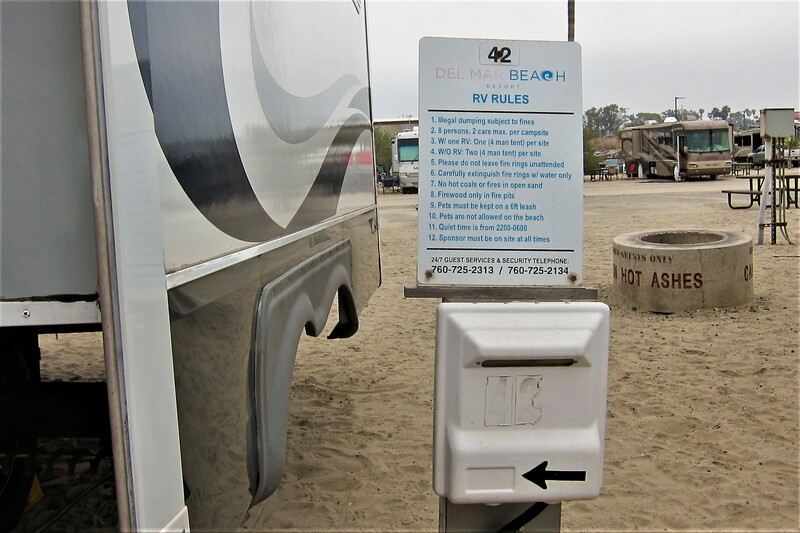 Unique to California oceanfront campgrounds is the ability at Del Mar Beach to park your camper on the sand, instead of a blacktop parking lot. 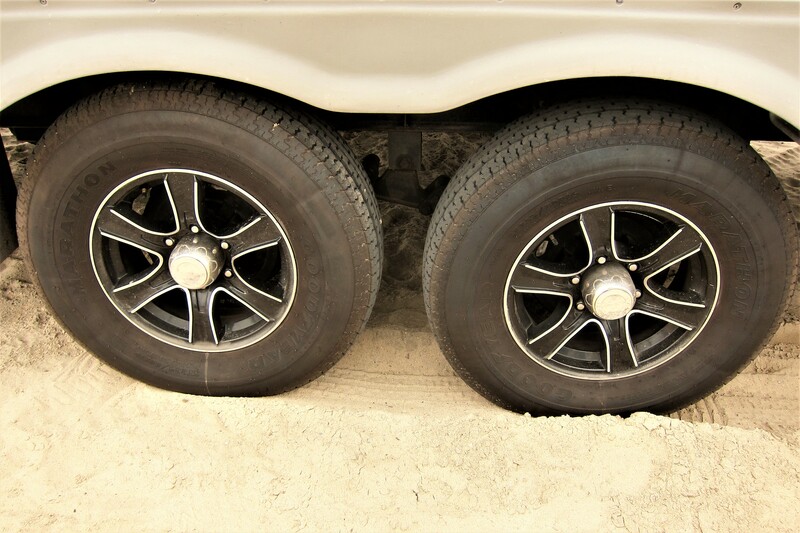 Although I had to use four-wheel drive to maneuver into the spot, and levelling the rig can be a challenge, but it’s worth the effort! 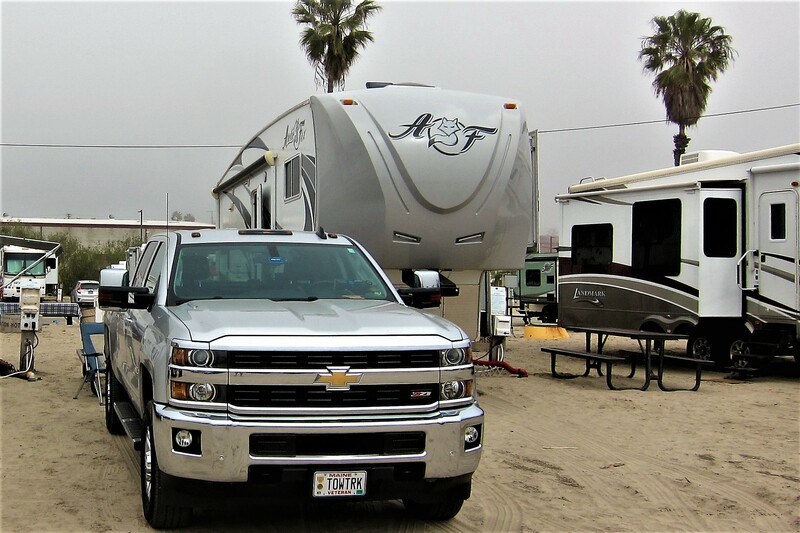 Del Mar Beach has become a must stop for us when Rv’ing the California Coast and we have enjoyed staying at this premiere campground every year of our past Excellent Adventure trips. 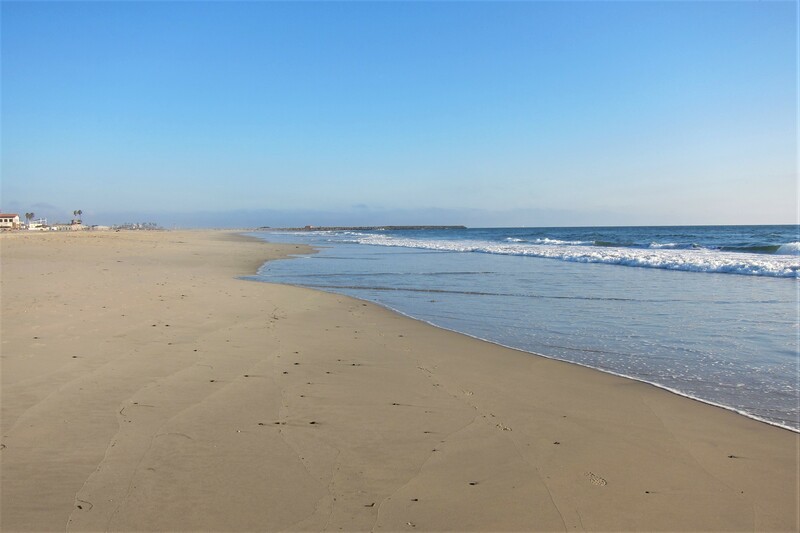 The campsites are a bit tight, and the basic campground amenities are sparse, but the location, beach access, kite flying opportunities, and views are unparalleled. This stay is more about enjoying the beach and less about doing touristy things. 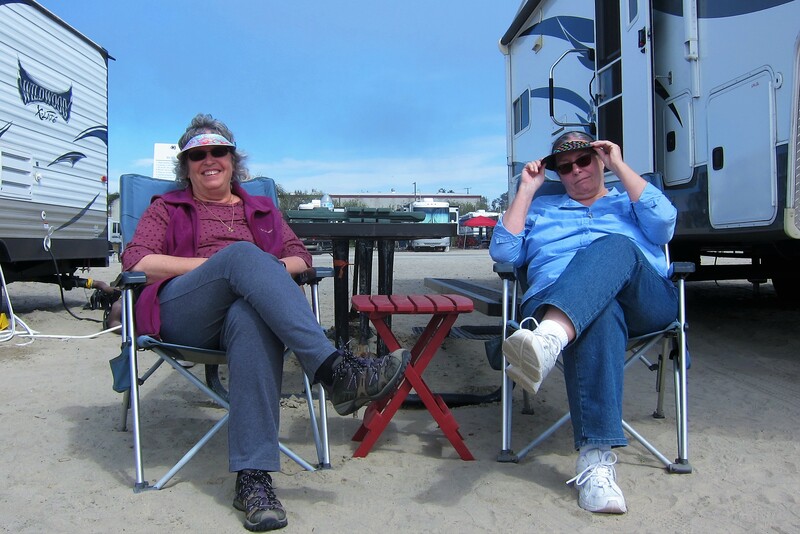 Kit and I spent our lazy days relaxing around the campsite, catching up on our reading, walking to the nearby Cantina for a snack, or strolling the shoreline with the other snowbirds. The various seabirds seem to be enjoying the beach as well including this little fellow that was fliting about the shore break looking for his breakfast one morning. 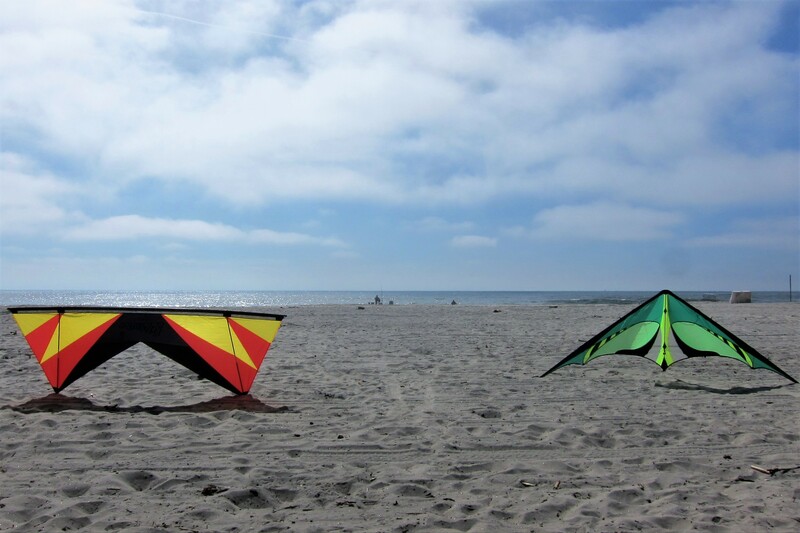 As mentioned, not only is Del Mar Beach one of the nicest California beachfront camping opportunities available, but the very large and flat sandy beach provides an excellent venue for high performance kite flying…which I made time for during most day’s during our stay. The kite on the right is my favorite delta configuration kite, and the one of the left is a quad line acrobatic kite called a Revolution…and it has given me fits since I purchased the thing some six years ago. Hard to learn and very difficult to master, the kite has frustrated me at every flying opportunity! If I don’t figure it out soon, you may see it on Craig’s List!?!? 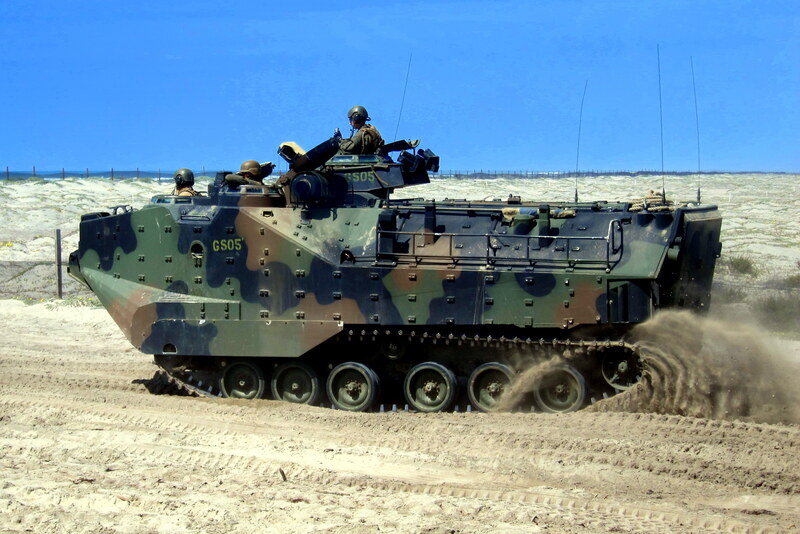 Camp Pendleton is the prime Marine Corps training facility for the Amphibious Assault Battalions and their tracked personnel carriers. 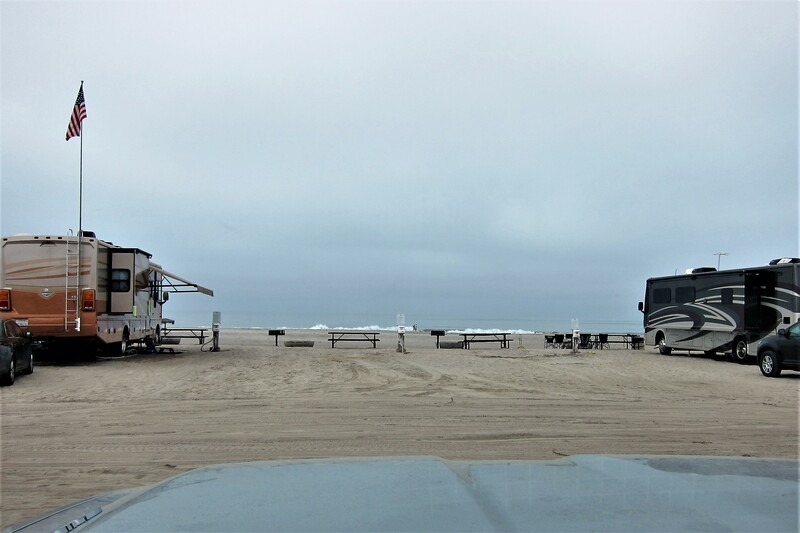 The beach where they train is just to the north of the RV Park and so we witnessed these huge lumbering vehicles rumble by on a daily business. 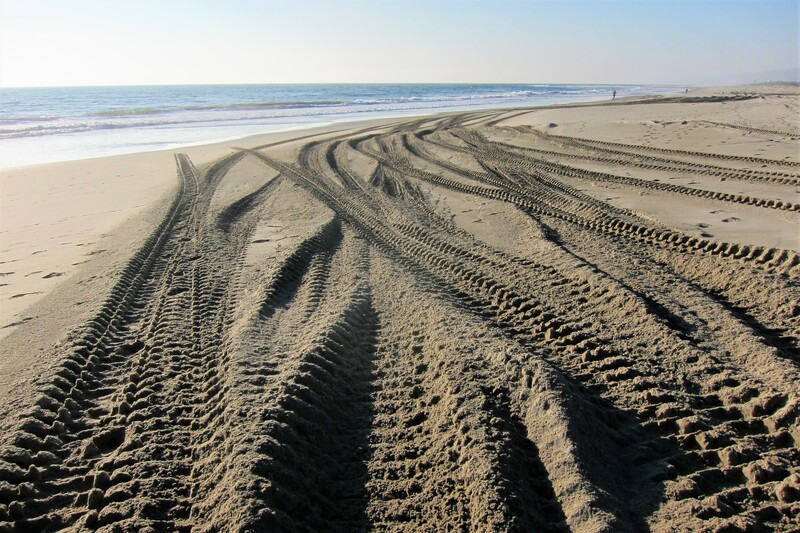 Just as military jet aircraft emit “The sound of Freedom”…the ground forces leave their own mark on the planet as well. 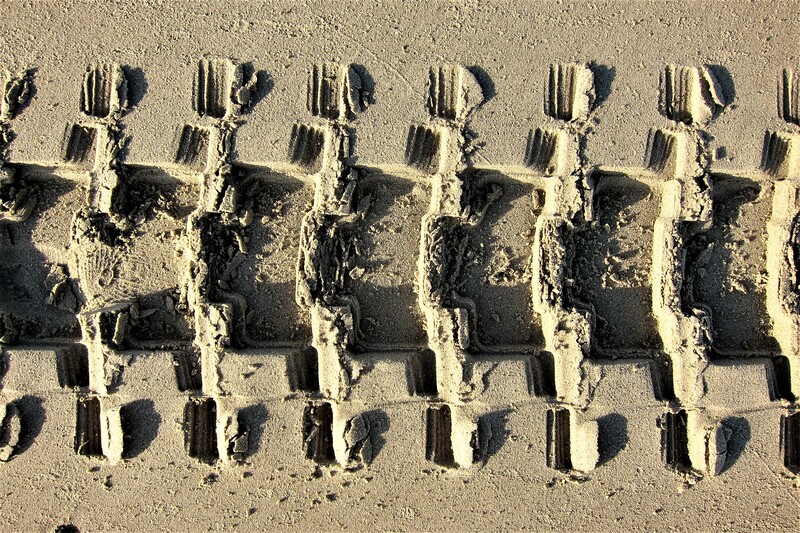 These telltale tracks can take on an artistic geometric design. Which I’ll title…The Artwork of freedom. As nice as the sunsets over the Pacific Ocean are, the corresponding sunrises from the east can be pretty spectacular as well! Which lends credence to why we really have no desire to go anyplace while camped here…however, we did make one foray into the base proper to resupply our food pantry, poke around the PX and tank up on Diesel. We also invited Kit’s sister Char and brother-in-law Don out to spend an afternoon. We walked the beach shoreline looking for shells, then enjoyed a nice meal at the Cantina, were they graciously picked up the tab, thanks folks…great seeing you again! We had the pleasure of hosting our friends JoAnne and Ron on the beach as well, after which we moved the party to one of our favorite restaurants…Phil’s Barbeque. 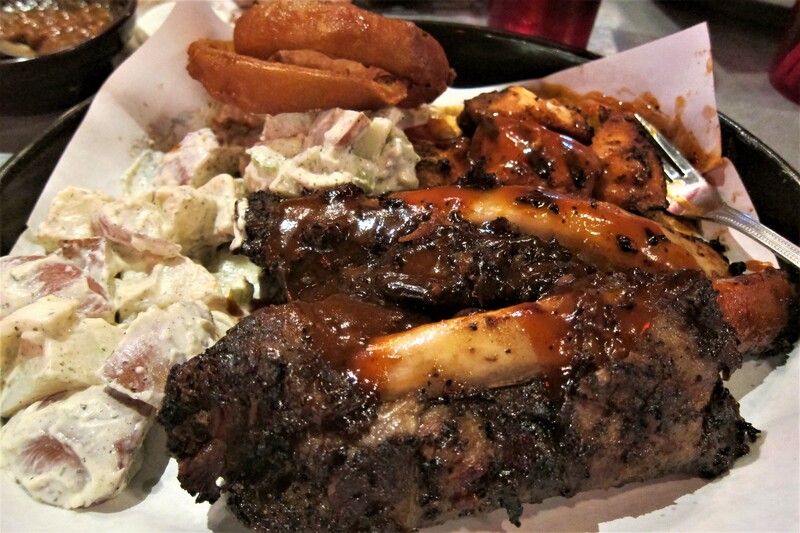 Where the food is darn good…especially the ribs! Great to see you folks again and enjoy one last meal together…thanks for traveling up from Santee! OK, I’ve stalled enough…a few days ago, when we pulled into this park, we were assigned campsite #48, so we backed into the space and hooked up. Um, see the problem? Arggg, what a rookie mistake!?!? Walking back to the office with hat in hand, I confessed. No problem, stay where you are…until Thursday!?!? So, mid-week, we moved to site #48. Yea, they need to refresh their site numbering! However, once again, the downside to journaling our travels is that lots of folks get to share in our SNAFU’s, I must be getting a bit feebleminded. 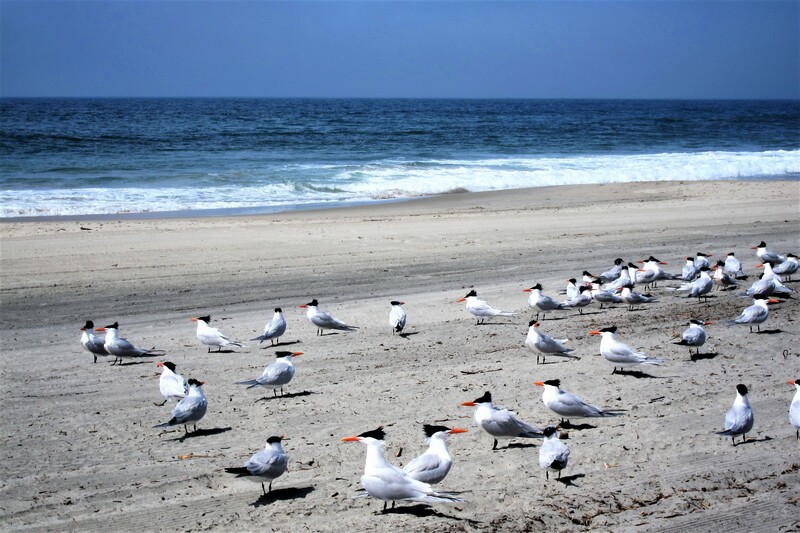 Speaking of which, I have a renewed interest in observing birds…while walking along the surf line one day, I tried to stealthily crawl up to a huge flock of shoebirds. Or, should that be “snowbirds”? Feebleminded, eh 😊…caught by Miss Proofreader Kit. 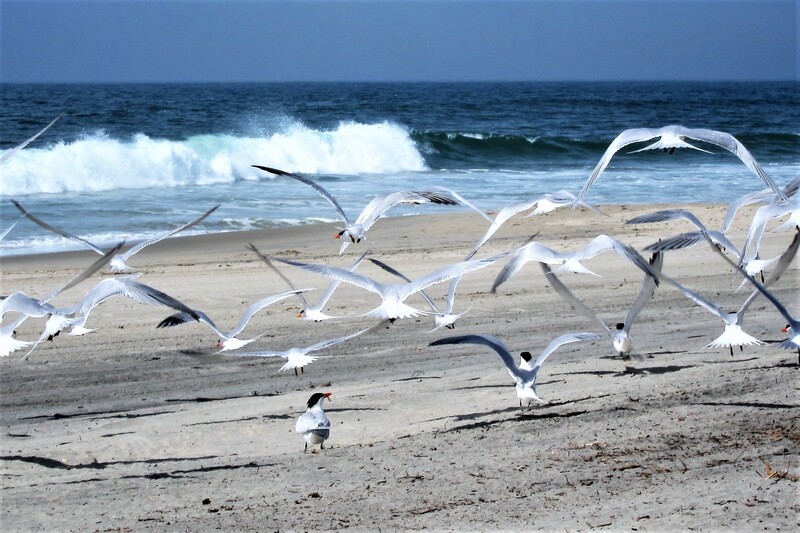 Yep, the all took off squawking then made a tight U-turn to line up for a bombing run…yikes, I just barely made it to a covered beach cabana! Well, our stay on the beach has come to an end punctuated by a final glorious sunset. Saturday, March 18, 2017: Up, had breakfast, broke camp and pulled out by 1130 as the typical morning fog began to lift. 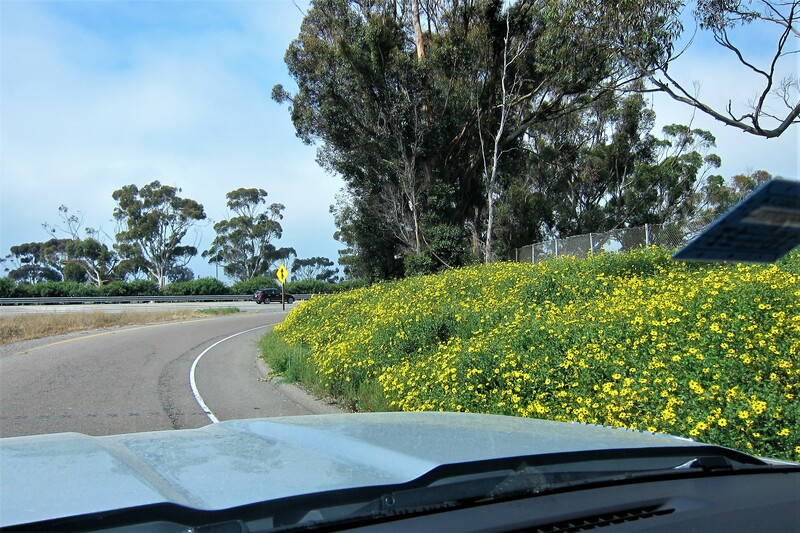 While heading north toward our next destination in Seal Beach, we noticed the continued proliferation of wildflowers due to the recent rains. 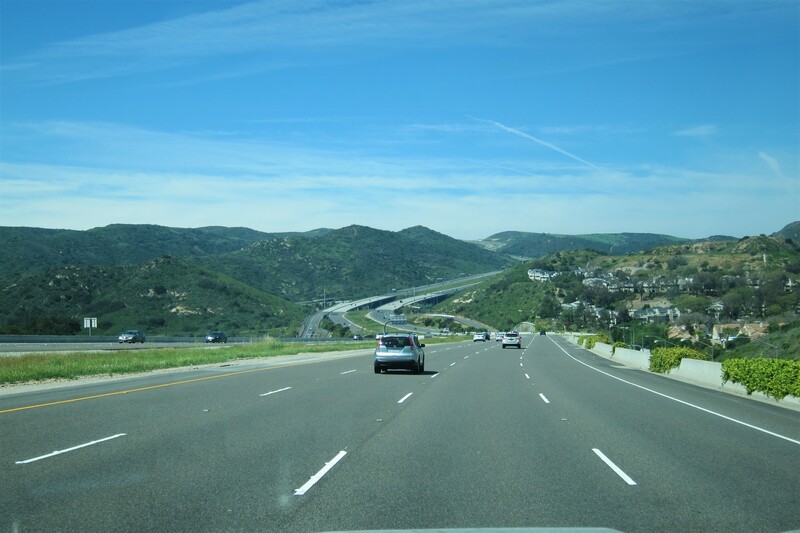 Cruising on I-5 North we passed San Clemente, San Juan Capistrano, Laguna Hills, and Irvine. 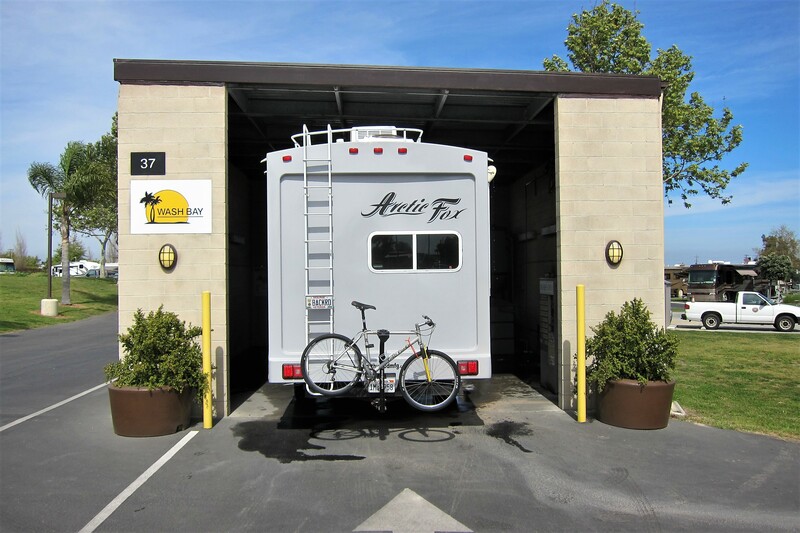 Where we moved onto I-405 which delivered us to the Seal Beach Naval Weapons Station, and our stop for the next few days. 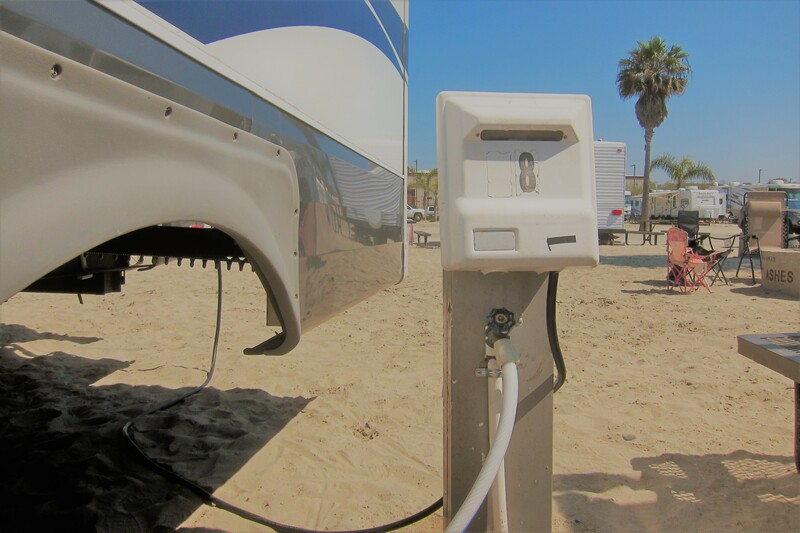 This Military park features a nice RV wash bay which comes in handy after camping in the salt and sand of the beach. 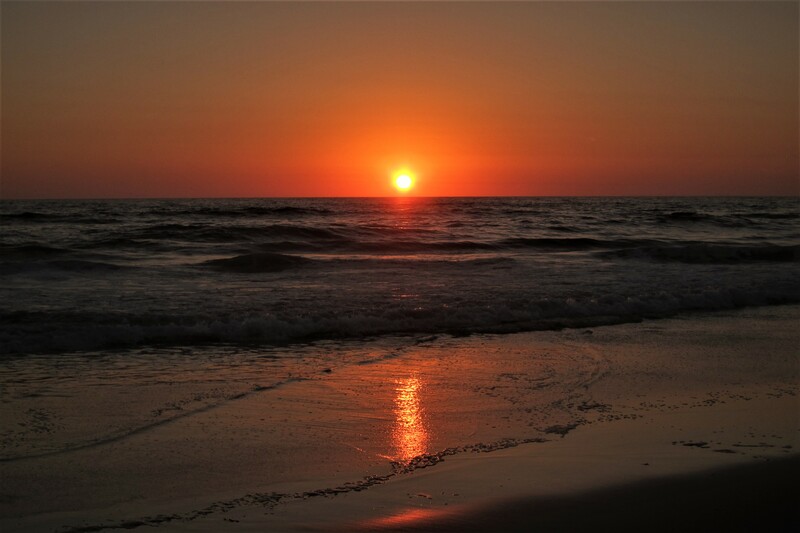 Since the last issue went way over my desired journal length of 20 pages, I’ll close this one a bit short…and, as a result, I have room to sneak in another California sunset photo. 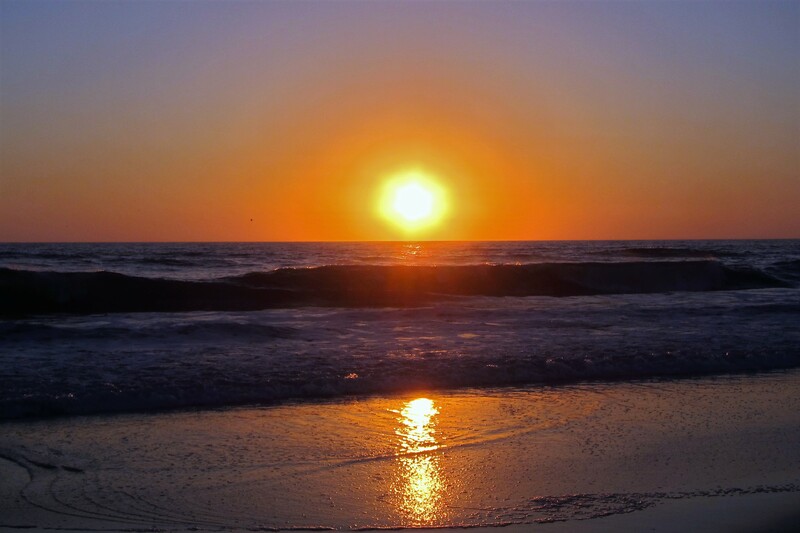 We are getting spoiled with your excellent photography…great sunsets! Now you need to get a bird book, so you can identify those birds along the way! 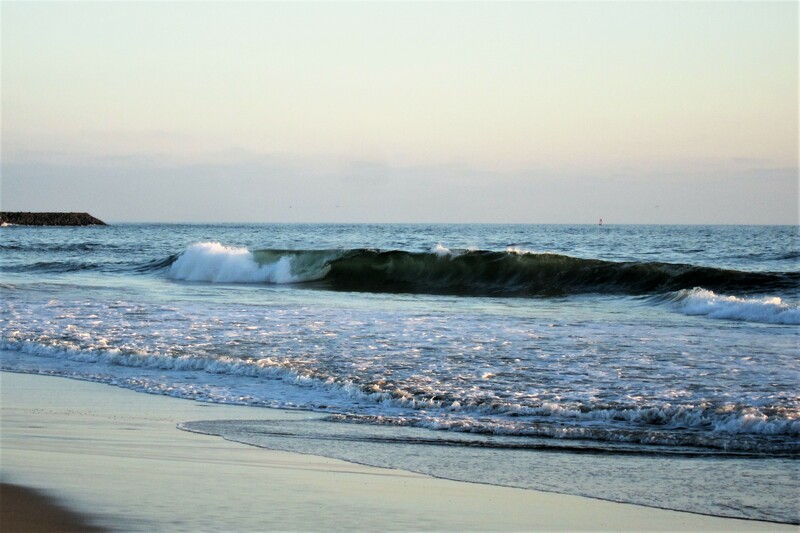 Your excellent photography and news are great…..did you have heavy weather along the coast recently? Hi folks, sorry about the delay in replying to your nice comment. Yep, a field guide to the flora and fauna of the Southwest would come in handy…but using the terms “plant” and “animal” is simpler! We did have a few days of intense rain while on the coast, pretty typical of that time of the year! Take care! Hi, sorry about the delay in replying to your very nice comment..time seems to fly by while on the road!?!? Hope you had a pleasant winter and are enjoying some of the nice spring weather. Look forward to seeing you out at the lake soon! Bill and Kit, glad to see you enjoying some time in Del Mar – such a beautiful location! Used to go there often prior to moving to NorCal in 1967! I bet you guys are now experiencing a hankering to head east towards Maine at about this point! 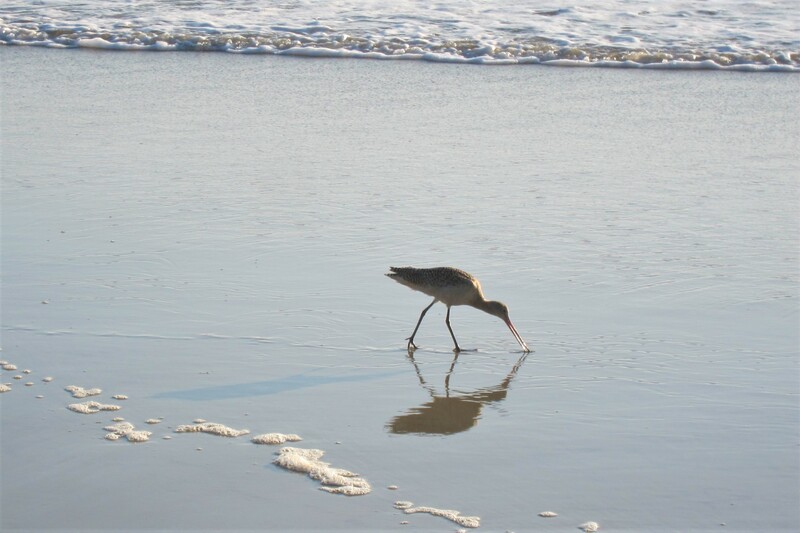 We love the Southern California coast…brings back many fine memories of growing up in paradise! Kit and I had truly intended to traverse the spine of California and see you folks as well as other neighborhood friends who live near Sacramento, then move on to explore Oregon and Washington. However an opportunity to spend spring break with the grandkids materialized, and as you know, that always takes priority! maybe next year?! Bill and Kathy, I am envious. I miss PHILS BBQ. Used to eat lunch at the Santee Phils at least once a week before I retired and moved away. Best BBQ and reasonably priced. You two always eat at the best places! 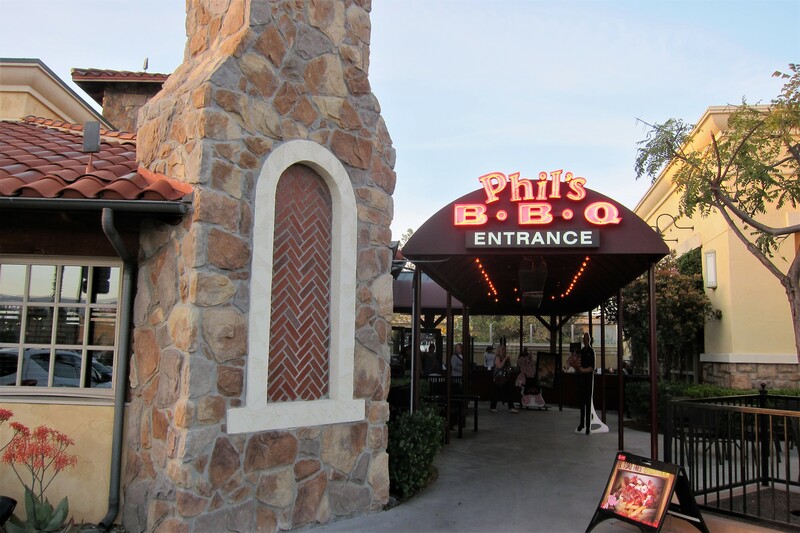 We agree, even after experiencing barbeque in Memphis, Kansas City, and the south…Phil’s is some of the best we have enjoyed!